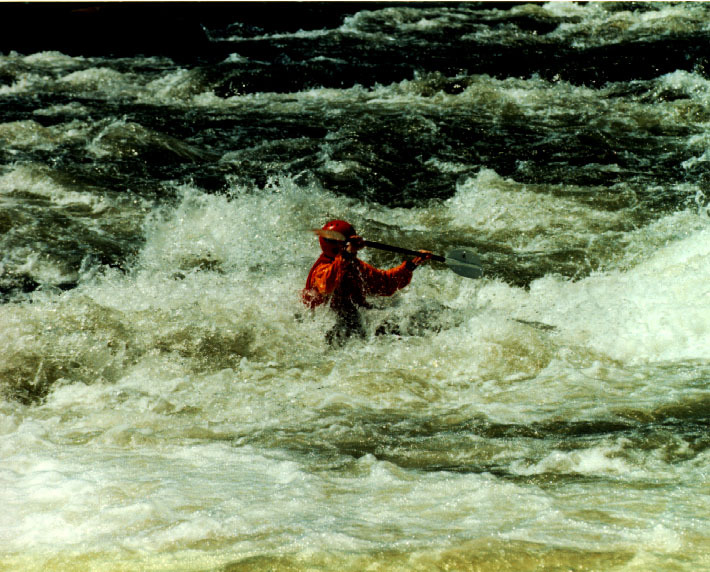 Check out this pictures of me kayaking the lower New River (West Virginia). Kent is my son and he is wonderful! He is 8 years old and a joy to hang around with. See some of the wonderful things we do together here. He's an amazing runner. More pictures of Jensen to follow. Brazil! I got to go to Brazil. Mostly for work (SIGIR2005) but I also got to spent time in both Rio de Janiero and in Salvador. The food, drink, people, and scenery were all wonderful. But my biggest highlight was learning how to build sand castles from an artist on the beach in Cococabana. Wow! Kent and I need to practice together now. Kent and I went back to Telluride again this year. I got to teach at the Telluride Neuromorphic Workshop and Kent went to summer camp. I enjoy the people and the mountains. Kent really enjoyed the chance to play with the robots. In two weeks Kent went mountain biking for the first time, explored gold mines, went camping twice without Dad, went backpacking once, and rode a go-kart. Wow. I went back to West Virginia for the GSP Raft Trip. Several dozen of my closest friends. I got to borrow a kayak and I can still roll! Hurray. It was fun to see everybody and to get back in a kayak. My friend Quynh and I spent a nice weekend in Tahoe. Exploring the west side of the lake and the fall colors. Very nice. I escaped to Zermatt, the Alps and the base of the Matterhorn before attending ICME 2002 in Lausanne Switzerland. The mountains around town are amazing. Two hour (uphill) hike to the hotel from the nearest road. Good food. Slept like a log. And great views of the mountains. Highly recommended. I got to attend the 1998 NFS Neuromorphic Computing Workshop in Telluride Colorado. Lots of neat people, lots of cool technology and a wonderful location. These pictures show a bit of everything. I also took lots of pictures of Kent at the 2002 workshop. After ICASSP 1998, I spent a long weekend exploring the Olympic National Park, and barely scratched the surface. These pictures primarily show part of the Hoh rain forest trail. I got to visit the Munich, Salzberg and the Bavarian Alps during May 1997. I really enjoyed exploring the Alps around Berchtesgaden Germany, hiking the mountains, and even the food. This is the view from one of our rooms at the Hotel Geiger. (The other room was equally spectacular.) There are two pages showing the cool things we found: a short postcard version and a longer version with more pictures. I have pictures from a trip that I took with my high-school buddy Dan Wolens to the North Cascades National Park (northeast of Seattle) in October of 1995. Camping, more water, and lots more mountains, snow, and fall leaves. This picture shows Ross Lake. Later in the same trip we visited San Juan Islands (North of Seattle). We spent a weekend sea-kayaking, enjoying the water, camping, and seeing the wildlife. The view from Speiden Island is shown here. Pictures from the 1995 (Unofficial) Interval Summer Trip to Yosemite are available on a separate page. Check out the view from the top of Lembert Dome (near Tuolumne Meadow) and from Clouds Rest (the highest peak near the valley.) Clouds Rest is shown in the picture to the left. I have two web pages documenting my professional life. My older work is documented here. It contains a list of publications and software that I have written. Be sure to check out a paper describing work I helped do to synthesize videos of talking faces and to morph sounds. My newest work--I'm now part of Google's Machine Percpetion Laboratory-- is documented here. I wrote a book with A. C. Kak about computerized tomography. The book is now available, for free, on the Internet. You may download individual chapters from http://www.slaney.org/pct/. Or buy a copy of the new SIAM book, a "Classic in Applied Mathematics." I also organize and schedule talks for the Stanford CCRMA Hearing Seminar. Check out the history of our talks on the web. I did all my academic training at Purdue University. My thesis was on algorithms and limitations of ultrasonic and microwave tomography and my PhD advisor and mentor was Avi Kak. Some of my spare time lately has been spent organizing and writing the web pages for the GSP Raft Trip. These pages chronicle 15 years of reunions by my friends from Purdue University (EE) and elsewhere. I got to attend Shihab and Gwen Shamma's marriage. It was quite wonderful and surprising. Here are some of the photographs. We got to spend an August weekend with some friends of ours from Interval helping Karon Maclean and Rich get married. It was lots of fun to see the San Juan Islands again. Kent enjoyed rides on the ferry and the sea plane. Another nice weekend in upstate New York helping Michele's ex-stepmother Carole get married. Lots of family, wonderful fall leaves, more excuses to take pictures of Kent. Lyn and Charles got married in 199X, in a magical ceremony, at Charles' home in Saratoga. Lyn is my favorite editor, so I'm really nice to her so she won't be so hard on me. Michele C. and I put together a book of pictures and memories from our wedding in 1991. (We are no longer married.) We gave copies of the wedding book to our parents and grandparents, and there is an online copy. Kent and I enjoy our nephews, Ross and Jay, and niece Erin. My brother, Jeff Slaney and sister-in-law, Cheryl Cook Slaney, live close by so we get to see them often. 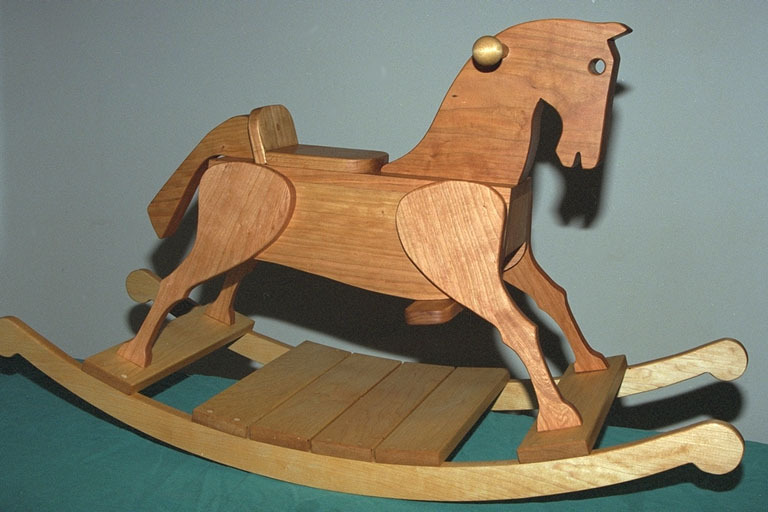 My father taught me woodworking and I used tools from my father's and grandfather's wood shops to make the horse shown at left. 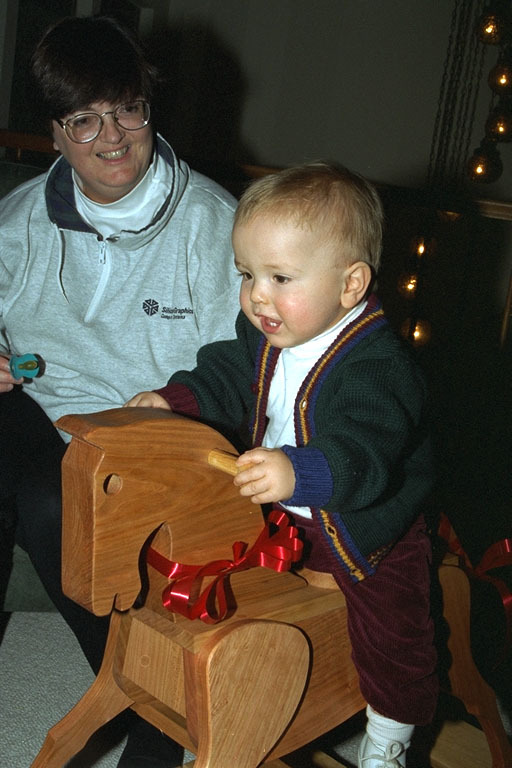 It was given to Ross for Christmas 1995. My sister,Jennifer Slaney, and mother, Patricia Slaney (send email for pointer), are also online. All photographs on this page copyright (c) 1995-2008 by Malcolm Slaney, all rights reserved. Last updated on January 28, 2008. The best way to reach me is via email. Send comments, questions, or suggestions to malcolm@slaney.org.